AAR Class: MWK: Snow-removing Car. A car equipped with any special device for removing snow from between or alongside of rails. Description: KANSAS CITY KS Sept 26 1979 -- UP steam snowplow 900075 appears to be freshly painted. It was built in Decembe 1949 and was retired in March 1979. UP donated the plow to the Kansas City Railroad Museum. 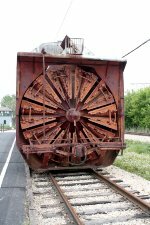 It now resides at the Illinois Railroad Museum. 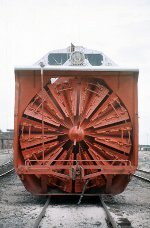 Description: If you squint, the UP snow plow almost looks like an armored train. Photo made during the Anzio Express event. 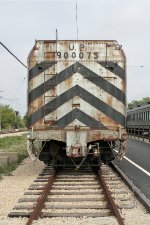 Description: UP #900075's current tender came from a C&O locomotive acquired by UP during the second world war. When to Locomotive was scrapped, the tender was retained for MOW service. Description: #25-RC-1594, built in 1924 by American Locomotive Company, ex UP #3572; nee C&O 1542. (source: UtahRails.net) Has a capacity of 21,000 gallons of water. 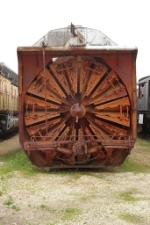 Description: Steam Rotary Snow Plow; Built by Lima-Hamilton Corp in 1949. Description: Receiving some restoration work. Description: Restoration work at the north end of the steam leads.